What Is Employer Brand? And Why Should Marketers Care? Which company would you rather work for? Coke or Pepsi? You can't answer that as quickly, right? Why is that? It's because you're very familiar with Coke and Pepsi's consumer brands. You've seen countless advertisements for them, likely tasted both, developed feelings about each brand, and ultimately chosen one as your favorite. You haven't necessarily had the same experience with Coke and Pepsi's employer brands. You may not know what it's like to work at those companies and what their corporate culture and values are. Employer Brand is defined as the attributes and value that is associated with a company as a place to work, and every company should have one. In fact, according to the Universum 2020 Outlook: The Future of Employer Branding, 81% of executives believe that by 2020 there will be a strong connection between consumer and employer brands. For a company to attract top talent, it needs a strong employer brand, just like it needs a strong consumer brand to attract customers. Talent acquisition is no different than customer acquisition — and that's why marketers can play a critical role in building an employer brand. For talent acquisition, marketers can help drive potential hires through a funnel by building awareness, generating interest, and ultimately driving leads. The easiest way to explain how to build an employer brand is to put it through a marketing lens. I want to show you how simple it is to use traditional marketing principles to craft a sound employer brand strategy. Remember your Marketing 101 class? Then you remember for the four "Ps". The same four Ps can be used in this context. Product: For employer brand purposes, the products are the jobs themselves. Factors like job responsibilities, seniority, benefits, and more all help shape your "product". Price: Price is a little abstract when talking about jobs, but you can think about as the prestige of your jobs. Are they highly coveted and in demand, or are they viewed less favorably? Are your jobs high-powered sports cars or four-door sedans? Not that there’s anything wrong with a sedan, but a Ferrari is going to be more desired and attract a higher caliber buyer, or in this case, a higher quality candidate. It’s ok if you have some jobs that are sports cars and some that are sedans. What’s important is to know the difference and to focus on building buzz and desirability around your most critical roles. Promotion: Just like in marketing, promotion is all about methods and channels you’ll use to get the word out about your “product”, aka your jobs. Place: Jobs are obviously not sold anywhere, so think about where they’re “offered” up to people: career websites, social media, staffing firms, employee referrals, etc. Different types of jobs may require different places. For example, senior level positions and internships probably won’t be promoted in the same places. One of the most important aspects of a good employer brand is authenticity. You don’t want new employees walking in the door thinking one thing about you and then walking out the door not long after because they were misled. 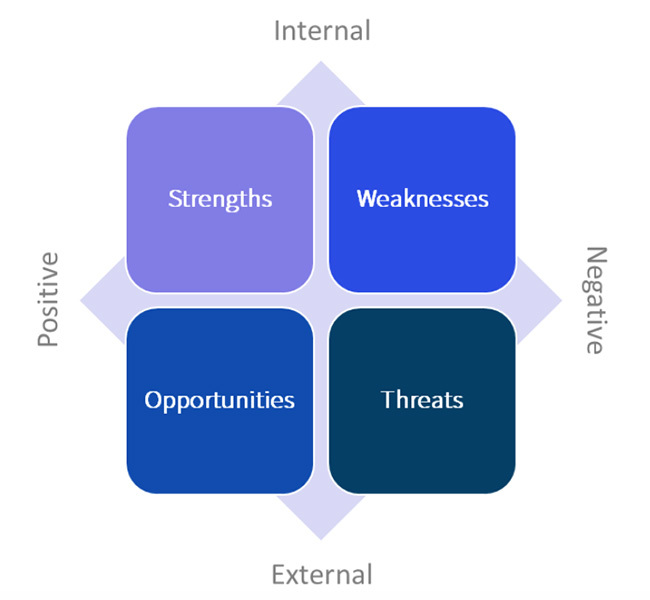 A SWOT analysis can help give you a clear picture of what aspects to highlight to prospective employees. Assess your strengths: Think about what characteristics give you an advantage. What makes your company a great place to work? The items you list here can be used as the basis of a value proposition or as differentiating factors between you and your talent competitors. Admit you have weaknesses: Every company does and you shouldn’t be afraid of them. By knowing what characteristics of your company put you at a disadvantage, you can downplay those areas and highlight your strengths that counterbalance them. For example, maybe your jobs require long hours, but you have a great vacation policy to balance that out. Whatever you do, don’t promise things you can’t deliver on to try to cover up a weakness. Look for opportunities to gain leverage over other companies: Opportunities aren’t necessarily strengths that you have today, but could move into that category if developed in the right way. Perhaps there’s an opportunity to open a new office in a market flush with talent, or a new product innovation that will woo the engineers that you need. Know your threats: Threats are external factors, often out of your control, that can make it difficult for a company to hit its hiring goals. Maybe the lack of STEM talent is causing concern about the future of the company’s ability to innovate? By acknowledging threats like this, you can proactively build a defense strategy to combat them. Perhaps on-the-job learning will arm your employees with the STEM skills your company needs. Positioning maps are great at helping companies assess their brand's position in people's minds vs. their competitors as in the example below. 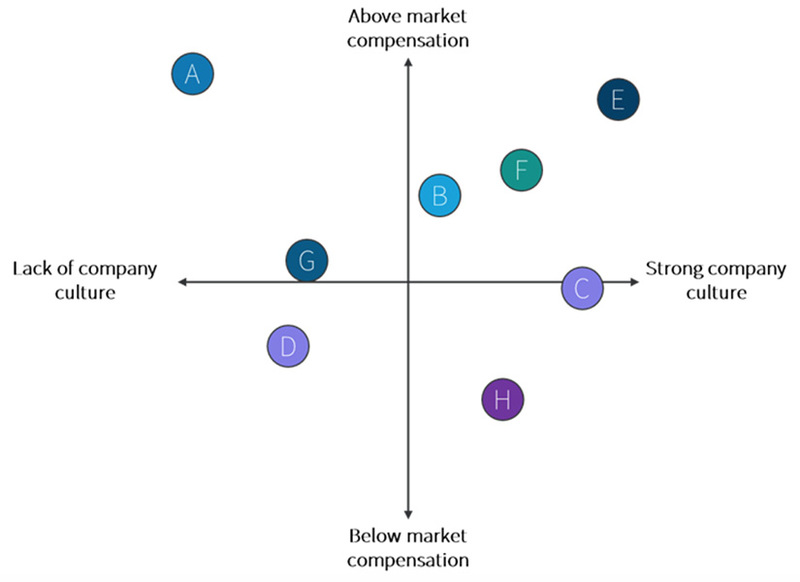 Just like chocolate brands can position themselves on key factors, such as high or low quality and high or low price, employer brands can position themselves similarly. Instead of measuring against things like price and quality, you can assess your employer brand against factors like pay and benefits, challenging work, strength of company culture, or learning and growth opportunities. You can do this for different types of roles or different geographies. The insights you glean from this exercise can point you in the right direction when you start to build your employer brand messaging. Have below average pay but a fantastic company culture? Then play that up and highlight what an amazing work environment you have! You can work with your talent acquisition partners to do an audience segmentation exercise for each of their key hiring segments. Below, you can see what types of qualities to list in each of the four categories: demographics, psychographics, behaviors, and geography. 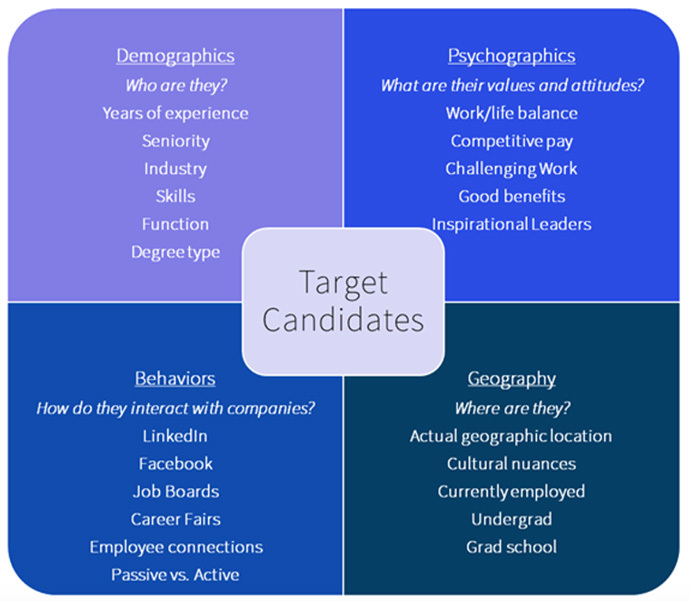 All of these exercises lead you to the point where you can develop unique personas for each of your company's groups of target candidates. Doing so will inform your messaging, the content you share, the job descriptions your talent acquisition team writes, and more. Having a persona gives life to an otherwise flat set of criteria, it puts a "face" to a list of a qualifications, and it gives you the ability to craft the right message that makes an emotional connection with candidates. Melissa is a software engineer with 8 years of experience. She started working at a large financial services company and recently moved to join a tech start-up, managing a small team of engineers. 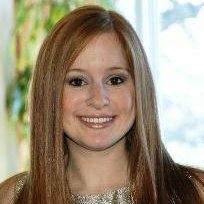 Melissa likes that she can make a larger impact at a small company and is working on developing her management style and coaching abilities. Her long-term goal is to be the CTO of a tech company and she'd also like to gain international work experience. She tries to go to networking events at least once per quarter. In her free time, she plays in a band and likes to try new restaurants with friends, she considers herself a bit of a foodie. Melissa is also passionate about theater and is on the board of a charity that promotes arts programs in public schools. So… you’ve made it this far! But why should you, presumably someone on your company’s marketing or communications team, really care about your employer brand and talent acquisition team? Because there’s something in it for you too! 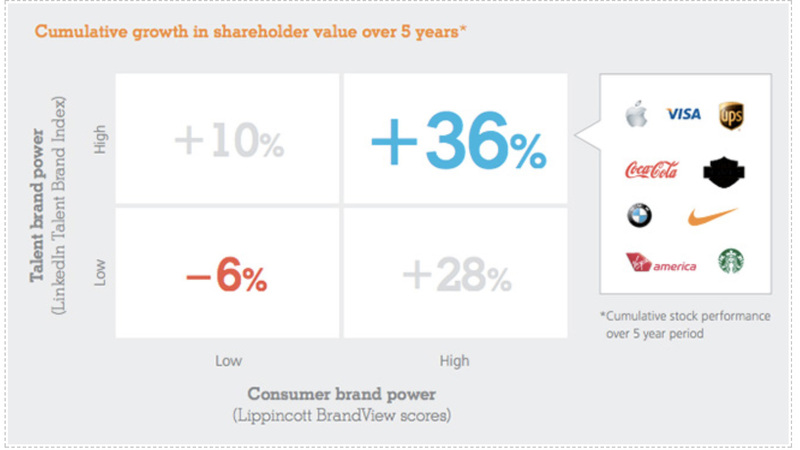 Joint research from LinkedIn and Lippincott found that companies with both strong consumer and employer brands financially outperform their peers – they had the highest growth in shareholder value over a five-year period. At the end of the day, lines continue to blur between consumer brand and employer brand, customers and candidates, and each helps strengthen the other. So, marketers... take the first step today and go say hi to your talent acquisition colleagues! I promise they’ll be thrilled to see you! To keep pace with the growing influence of marketers within the organization, subscribe to the LinkedIn Marketing Blog today.